You guys. The tahini obsession is real. Especially when coated in smooth dark chocolate and topped with a smidge of sea salt. If you saw my stories on Instagram a while back, you know that I tried so hard to make tahini brownies work. Four different times, to be exact. They all came out either too gritty, too cakey, or, if you ask Mr. Table, tasting like dirt. After spending far too much money on tahini, I decided to table that recipe indefinitely. But I am still obsessed with tahini, and I especially love it with dessert. It adds an earthy, nutty flavor to desserts to cut the sweetness in the most delicious way. My favorite compliment to tahini is an extra dark chocolate, so I decided to go for a little bit easier recipe that involves no baking, just a couple of ingredients, and very imprecise measuring. I needed an easy win. 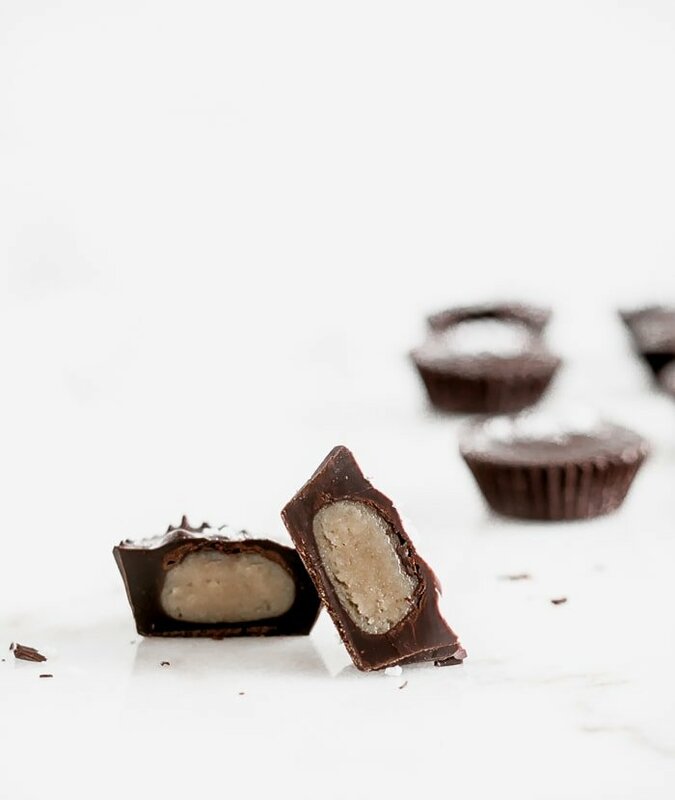 So I went with an adult variation of peanut butter cups – can’t go wrong there, right? The results could not have made me any happier. 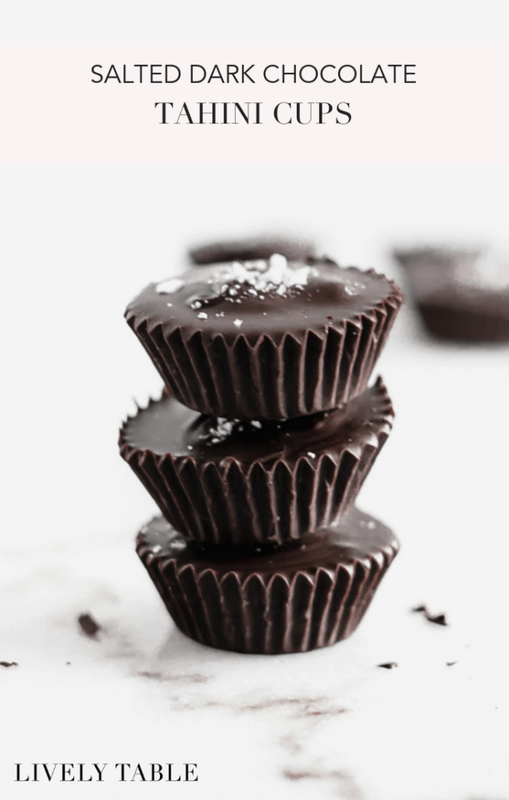 These salted dark chocolate tahini cups are absolutely delightful. The perfect little sweet treat to end a meal, that’s really not all that sweet yet so satisfying in the most perfect way. With simple recipes like this, it’s important to always use quality ingredients. Use the best dark chocolate you can (I like an ultra dark version – 75-80 % cocoa) and a good, unsalted tahini. And the flaky sea salt is a must! If you can’t find it at the grocery store, it’s available on Amazon (so is tahini). 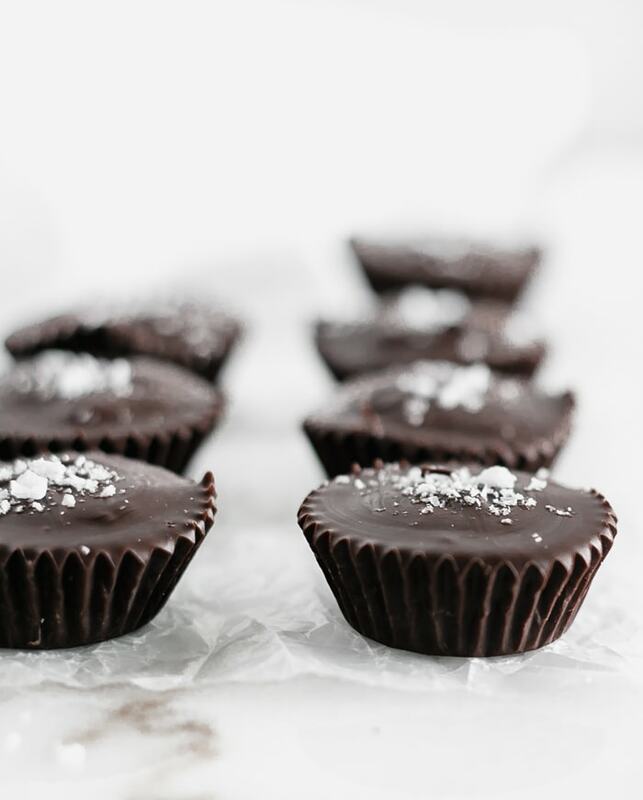 How do you make salted dark chocolate tahini cups? 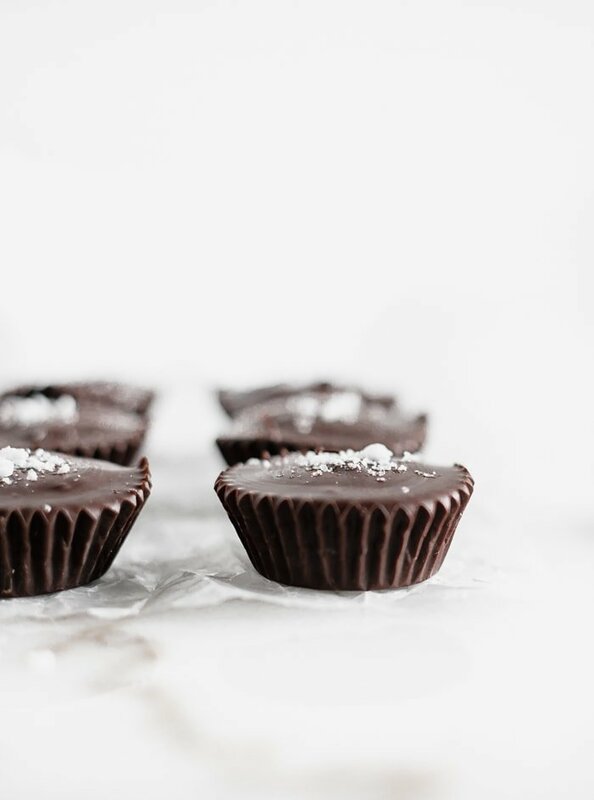 These little cups of bliss are so simple to make – simply melt the chocolate, spoon a bit into mini paper muffin tin liners, top with a simple tahini mixture, more chocolate and touch of salt. The hardest part is waiting for them to harden so that you can sink your teeth in! 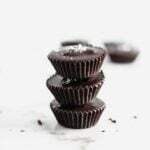 Are these dark chocolate tahini cups allergy friendly? Yes! Tahini comes from sesame seeds, so it’s nut-free. Chocolate and tahini are both naturally gluten-free. 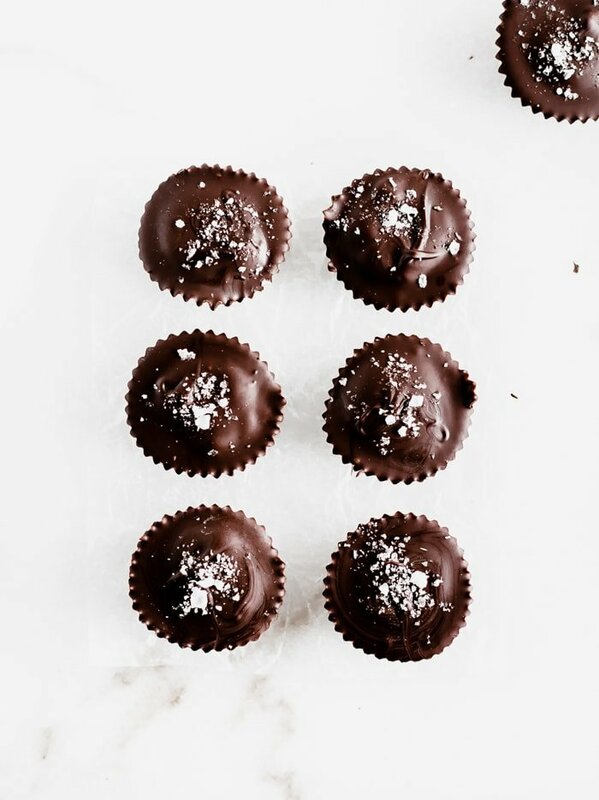 And you can get dairy-free dark chocolate, if needed, which will also make these treats vegan. If you’d like, you can even get stevia-sweetened chocolate (I love Lily’s brand) for a no added sugar treat! 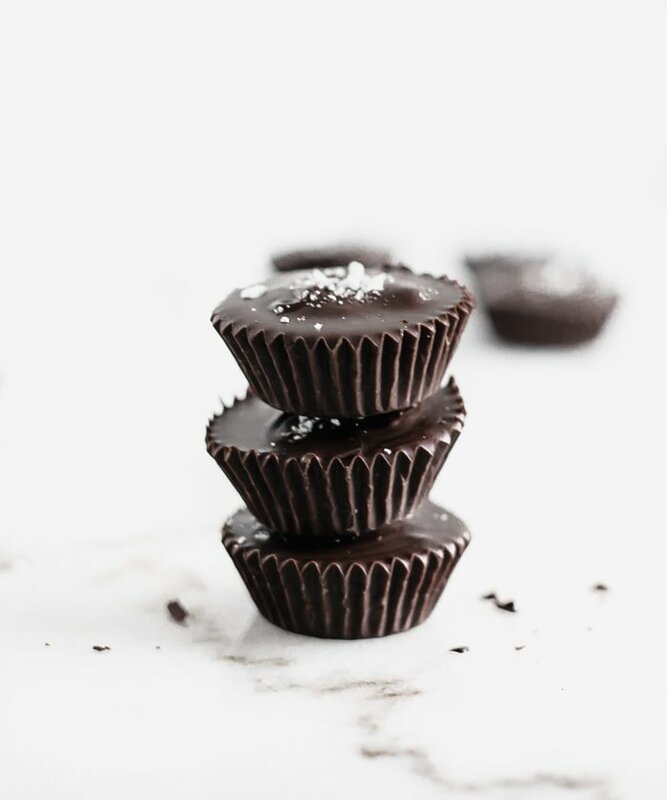 If your love for tahini runs as deep as mine, trust me when I say you need these salted dark chocolate tahini cups in your life!